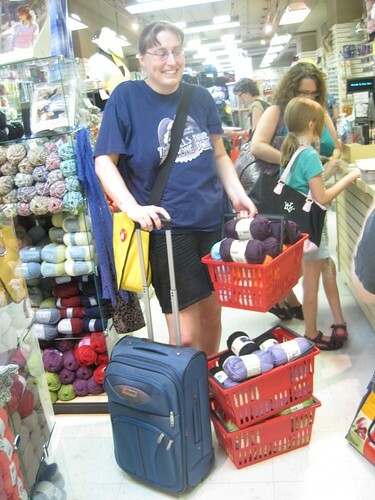 Yesterday marked another year of the Toronto TTC Knitalong, an event that has changed hands from one set of organizers to another over time, and sees a slightly different yarn shop landscape every year in the city, but has been going strong for four or five years now. It is an excuse to roam the city as knitters, shopping and knitting and generally raising the visibility of the craft as we go. The participant fees contribute mostly to a hefty charitable donation to Sistering, a local women’s charity, and mostly it’s just a good time and an excuse to be part of a roving band of knitters for the day. And we lucked out and got a sunny hot day that wasn’t quite so hot as to be mimicking the face of the sun, so that was a bonus. Along with Lisa, I was a captain for the Red Team this year, which started in the north end of the city at Passionknit, stopping at Mary Maxim and then Knitomatic before finishing at Romni Wools. Many of the shops offered discounts or prize draws, which was an added bonus and extra bit of enabling. (I very nearly had a falling down in front of the Malabrigo Chunky in Romni Wools, then came to my senses. Though I did emerge with a bit more Cascade 220 and Royal Alpaca by the end of the day). And then we had beer afterwards, and lo, it was good. Team Red was a pretty awesome team (not that I’m biased), and I know a lot of folks went home smiling with a lot of new purchases, and even some new Works in Progress on the needles. It is always a lot of fun doing things like this, because you can go around for the day completely immersed in Knitting World, without actually leaving the Real World of the city. You get to be among your own kind (with whom you can say things like “hey I almost lost it in front of the Malabrigo Chunky over there”, and they will know exactly what you mean, or they will not blink an eye if you do things like read a pattern on your cell phone in one hand while casting on with the other), and yet you don’t have to retreat to the woods to reach said Knitting World. It’s like day camp for knitters. The other fun part about this is encountering the reaction from non-knitters, because in using streetcars and subways to get around on a Saturday (or even walking around), while also knitting (because a lot of knitters plan ahead and bring projects they can work on while standing or riding transit), and while carrying bright red tote bags…uh, well…we get noticed. We had an interesting bit of chatter with one guy on the streetcar who was genuinely curious what it was that we were doing (he wondered if we had arranged to have a team on every single streetcar/subway in the city), and we explained about the knitting and the shopping and the charity and the fun. He nodded and seemed to think this was reasonable, but then commented that we “seemed a bit young to be knitters.” We explained to him that, no, actually knitters come in all ages and in fact some of the fastest growing age demographics in knitting are the young adults. It is easy, immersed in knitting world and only sharing our craft with other knitters, to forget that some people actually experience this world as brand new information. It always seems like people should have caught on by now, that everyone should know by now that knitting world is actually pretty big, is located everywhere, and lived by people in all walks of life. Sometimes, you need to go out with a big group of knitters and pull out your knitting in the middle of a busy subway, just to make sure that everyone knows that, just in case they’ve forgotten – because they sometimes forget. And really, we are all, in fact, just the right age for this. Happy knitting this Sunday! Wherever you are. Happy knitting to you too! Looks like a lot of fun!!! We don’t have anything like that here. What a delightful day you all had and it’s great that you are spreading the word that knitting is for all ages and stages of life! You all looked like you had the most marvellous day! What fun!! I’d love to be part of that one day. I’m 22 and I get a lot of (usually older people) telling me that it’s really nice to see someone my age knitting. Especially when I’m doing colourwork for some reason, or when I’m doing socks/mittens (and heaps when I’m doing colourwork socks/mittens lol) something about the two balls or more of yarn and the five needles sticking everywhere seems to fascinate people… me included! 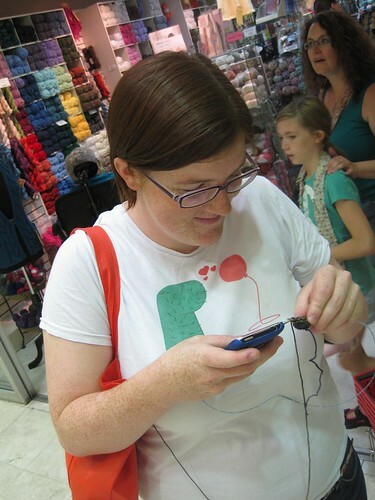 I love knitting in public, if only I lived in Canada and not Australia! On the other thing, I’m apparently not at an age where I get the “aren’t you too young for that?” comments any more. 😉 Either that or the Upper Midwest is a) too polite to ask that question or b) too used to seeing people do all manner of hand crafts. Or possibly c) I’m simply oblivious! That sounded like the coolest day ever! I wish we had something so fabulous down here. Thank you so much for letting us knit vicariously through you. Fun, fun day. I’m so very jealous! I’m the only “young adult” knitter around here as a far as know and am working to get others involved. When I go to a knitting or spinning guild its me and some errr mature (?) women. Not that I don’t love getting to know them, but I would love to keep knitting alive in our area by introducing some young knitters. Here in Portland Oregon we have two “Shop Hop’s” a year. 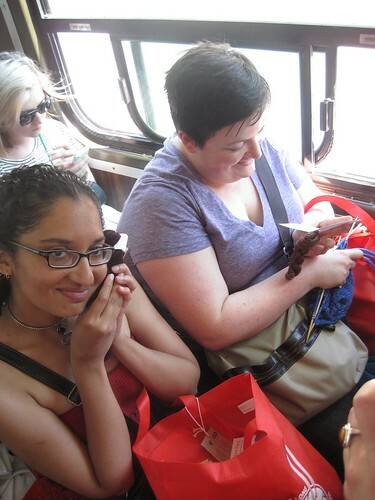 Tons of fun to have people discover knitting isn’t a lost art. Been knitting for 52yrs and still loving it! This looks so fun! Maybe next year. I think it’s nuts that people associate knitting with little old ladies. I do it because I’m fidgety. That looks like a lot of fun!! My wife and I both knit, so sometimes i’m completely caught off guard by people’s reaction to it. That sounds like immense fun!! I have never been to a yarn crawl and i’ve never participated in a KAL but it’s so tempting at this point…what is it about this craft that makes people want to be TOGETHER?? I like that last picture. That looks like what I wish I could do at a yarn store. Just carts and carts and carts of yarn. Sounds like the day was a great success. 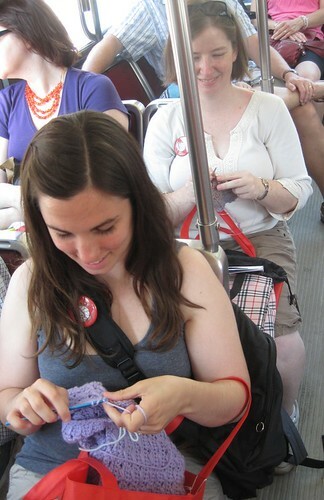 So cool to see so many of you knitting on public transport too. I really miss knitting on long haul air flights, it really used to pass the time quickly.